Jennifer Kesse was a beautiful, intelligent, and independent 24-year-old with everything going for her. She had a good job as a finance manager at Central Florida Investments Timeshare Company and had even purchased her own condo at the Mosaic at Millenia complex in Orlando FL. She was in a healthy relationship with her boyfriend Robert who lived only a couple of hours away in Ft. Lauderdale and was very close to her family who lived in Bradenton, FL. In 2006, the pretty blonde haired, green eyed girl left for a short vacation with Robert and some of their friends to St. Croix, flying out of Miami on January 19th. During that weekend, with Jennifer’s permission, her brother Logan stayed at her condo with some of his friends. Flying back to Miami on Sunday, the 22nd, Jennifer spent the night at Robert’s apartment and left the next morning around 6 AM making the three-hour drive to her job in Ocoee, FL. That night she left work at 6 PM and went directly home. She spoke on the phone with her parents, Joyce and Drew, and her brother. During that call, Logan informed her that one of his friends had accidentally left his cell phone behind at her place and asked if she could ship it to him. She agreed to overnight it the following day. After speaking to her family that evening, at exactly 9:56 PM she called Robert. The couple routinely spoke to each other every night before going to sleep and every morning on their way to work. The following morning, Robert called Jennifer on her cell phone only to be sent directly to voicemail. He knew that Jennifer had an important meeting that morning so he most likely told himself that it was keeping her preoccupied. When 11 AM rolled around her co-workers became concerned. Jennifer was not in any way a flaky girl. If she were to miss work or show up late for any reason she would, without fail, notify someone regardless of whether or not there was an important meeting she was required to attend. Alarmed, one of her coworkers called Jennifer’s parents who were listed as her emergency contact. Her parents immediately contacted the managers of her complex and asked them to check her condo to see if anything looked suspicious while they began the drive from Bradenton to Orlando. The managers noted that Jennifer’s car was gone and she was not in her condo. Logan arrived at her place at 3 PM while Drew and Joyce arrived at approximately 3:15 PM. As Jennifer’s family searched her condo, it was obvious to them that she had been there earlier in the morning, getting ready for work. The bathtub showed signs that Jennifer had showered just a few hours earlier: puddles of water surrounded her shampoo and conditioner bottles and a damp towel was draped across the dryer in her laundry room. Her hair dryer and makeup were on display in the bathroom and her pajamas lay on the floor near the tub. In her bedroom, her bed showed signs that it had been slept in and some articles of clothing were spread out on it, indicating that Jennifer had been trying to decide what to wear that day. In a podcast created to help in the search for Jennifer titled Unconcluded, Joyce Kesse stated in an interview that Jennifer was very excited about a pair of Nine West alligator pumps that she recently purchased. Those particular pumps were missing from her closet and Joyce noted that the pieces of clothing that she had pulled out and placed on her bed would have matched those shoes. (In my personal opinion, I don’t believe the condo was staged by the abductor.) Her condo was equipped with a home security system, but it was never set up although there was an emergency button in her bedroom, behind her headboard. That alarm had never been set off. Jennifer’s family contacted the Orlando Police Department that afternoon, but police were convinced that she most likely took off on her own to clear her head after having an argument with her boyfriend. I am not completely sure if the couple argued the previous night, but whether or not this was the case, those closest to Jennifer knew that she would never have reacted in such a way. The police later tried to convince the Kesse’s that Jennifer might have gone out that night to ship out Logan’s friend’s phone which made no sense to anyone. 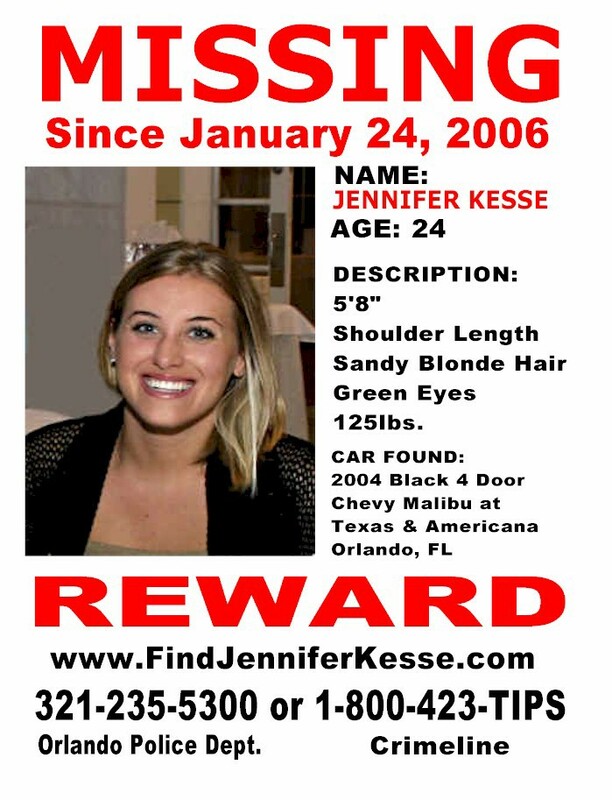 Later that evening, family and friends began handing out flyers with Jennifer’s picture and other pertinent information around Mosaic of Millenia and the surrounding area. They would utilize her condo as their base of operations for the next eight months. One important piece of information that should be noted is that the Orlando Police never processed Jennifer’s condo as a crime scene. Two days later, after Jennifer’s disappearance had been broadcast, police received a call from a resident at HOTG informing them that they’d come across Jennifer’s car parked near the complex pool. After processing her vehicle the only evidence found were a latent fingerprint and a small fiber. No information has ever been released about what might have been in the trunk, however, a DVD player given to Jennifer by Robert was strapped into the back seat, indicating that robbery was not the motive behind her abduction. To this day, though, Jennifer’s briefcase, purse, iPod, keys, cell phone, and Logan’s friend’s cell phone have never been located. Whether the abductor(s) took these items or they remain in an evidence locker, being withheld from the public, remains to be seen. Online you can find a plethora of information about both cell phones and how the batteries were supposedly removed from them the night before, rendering them untraceable. According to the Kesse family, this information has never been confirmed. Since her disappearance, there has been no activity on Jennifer’s cell phone, bank accounts, social media accounts, etc. That Friday, January 27th, the Kesse family was made aware of the video footage from HOTG of Jennifer’s car as well as the driver who, at this point, had become a person of interest (POI). Unfortunately, the video is of very poor quality and the POI’s face is not at all visible. Bloodhounds would trace the scent of the driver from her car all the way to the bottom of a staircase towards the back of Jennifer’s building; the stairs closest to her condo. The trail ended there. After viewing the security footage, many people are convinced that the POI is dressed in a construction worker’s uniform while other’s believe it is a security guard uniform. Some believe the POI is wearing a ponytail while others believe it is some sort of helmet. The quality is so poor that I won’t begin to speculate. The video can be found below. Those closest to Jennifer would confirm that, not only was she a bright, kind, and responsible young woman but she was also extremely safety conscious. An avid fan of the Law & Order television series, she was well aware of the dangers that could befall a young woman living alone and was knowledgeable on how to protect and defend herself. This is not to say that she was completely exempt from being the victim of a crime, however, Jennifer was known to be overly cautious about her surroundings, never leaving her car doors or condo door unlocked, never opening her front door to strangers, etc. In fact, the night before her disappearance, Drew Kesse mentioned in his interview on the Unconcluded podcast that while she was on the phone the night of the 23rd, someone knocked on her door and she chose not to answer. She claimed that it was one of her neighbors, but to this day the person on the other side of the door is unknown. Jennifer moved into her condo November of 2005, right before Thanksgiving. During this time, extensive renovations and construction were being made throughout the complex as it had recently been converted from rental apartments. When she moved in, the complex was not yet at full capacity. Jennifer made mention to several people, including her parents, that the construction workers (some of whom resided in the unoccupied condos while they worked on site) regularly leered at her, whistled and made catcalls, causing her to feel uneasy. In his interview, Drew Kesse speaks of how one day while on the phone with Jennifer there were a couple of workers at her place doing touch-up work on a paint job. Jennifer took the time during her lunch break to drive home to unlock the door and stand by while the workers did their job as she refused to allow anyone inside her home while she was out. As she kept an eye on these workers, for additional safety measures, she spoke with her father over the phone. Drew was able to hear the workers in the background and noted that they spoke no English; Jennifer even attempted to communicate them, but they were unable to comprehend. Several years later, Drew would discover that one of these workers had been arrested and thrown in jail; for what type of crime, I’m unsure. As it was discovered that this person worked at Mosaic during the renovation period, he was asked during questioning whether or not he had ever been in contact with Jennifer. According to Drew, this person claimed that, yes, he knew who she was, she was a nice girl, and the last time he saw her, she told him and his coworkers to “lock up before they left.” Anyone who knows Jennifer knows this cannot be true. Did this person have a reason to lie about Jennifer leaving him her key or a copy of her key? Could he have confused her with another resident? Could the language barrier be to blame? While Jennifer’s boyfriend Robert was cleared as a suspect, it is widely known that Jennifer’s ex-boyfriend Matt was at a bar called Blue Martini located across the street from her complex. Rumors abounded that he was still in love with Jennifer and wanted to reunite with her. The Blue Martini was a popular hangout at the time, so it’s not completely unusual that Matt was there with friends. While the Kesse family does not suspect him and he does have alibis for that night and was at work the following morning, he was never given a polygraph test despite the fact that he agreed to take one. He simply was never contacted after he agreed to do so. What I have provided here is only a fraction of what can be found online. There are other theories that can be analyzed, however, after what I’ve read and listened to I can’t help but wonder if any of the ones mentioned here are the most likely. The question of human trafficking has also come into play, but many feel that Jennifer does not fit the profile of someone who would be kidnapped for that sole purpose. Then again, it’s not beyond the realm of possibility. At this point, I don’t think much can be discounted.